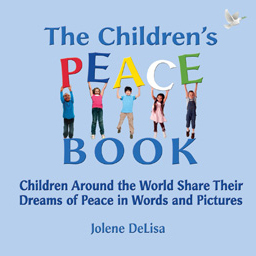 The Children's Peace Book is Jolene DeLisa's message of hope. She asked children around the world to share what peace means to them in her global travels, on peace marches, and in everyday encounters. Their words and drawings have been brought together in this memorable book. As Jolene writes in her introduction: Put a group of children together and they overcome language and culture and quickly learn how to be friends. We must learn from them. Beautifully illustrated with colorful drawings by the children, as well as photographs of many of them, this full-color book offers a powerful message. An ideal gift for anyone who cares about peace, and a great way for non-profit organizations to thank their donors.Available in both soft and hard cover. To pre-order the hardback edition or to learn about ordering both hard and soft cover editions in quantity, please contact Blue Point Books at 800-858-0058. Quantity discounts are available for both hard and soft cover editions. To order individual copies of the paperback edition of The Children's Peace Book, click here. The light of Jolene DeLisa's life example of action is captured in The Children's Peace Book. The stunningly beautiful illustrations from children around the world are laced with poignant messages that bring us all the promise that God is not yet dissatisfied with humanity. There is hope in the hearts and minds of children everywhere. The Children's Peace Book is an exquisite collection of drawings and sayings from young, innocent, and deeply wise children. If we all follow their admonitions for peace and beauty we would stop killing each other. The wisdom of innocence!. This elegant and important book shows that children possess timeless wisdom and the potential to become adults capable of making monumental advances in the struggle for peace. This book is filled with hope and insight, and it is a valuable tool for educators, activists, parents, and all people who care about humanity and our future.. The only antidote against contemporary violence, war, and other atrocities is good-hearted heroes like Jolene de Lisa, who has relentlessly searched for peace. She is an example of a project of life towards the light. This book sows peace among children which will bloom into a sweet gift for humanity.